After the overwhelming success of their debut album DIE REKLAMATION, Wir sind Helden must have been unsure where to go next. 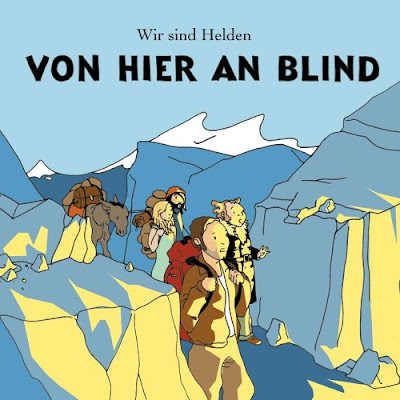 Sophomore albums are notoriously difficult, especially when they follow a smash hit (ask the guys in Crazy Town), and the title of Helden's second album -- VON HIER AN BLIND (From Here on Blind) -- indicates the band moves into unknown territory, as suggested also by the artwork -- Tintin-like drawings of the band on an expedition through the mountains. However, the only new territory the group explores is the certainty that expectations are huge: having to move on after a best-selling record may be an unknown feeling for the group, but the music they come up with sounds all the more familiar -- and not in a good way. For most of the record, the band eschews the keyboard-driven songwriting of their debut album and opts for a more generically guitar-based, radio-friendly sound, which removes much of the song's edges. The record begins with two quiet, introspective numbers, which is an interesting choice given most of the first album's hit singles were uptempo German new wave-y rock songs; the group then settles into a cool groove with the title track, which is one of the album's highlights. But then, the group stumbles. "Zuhälter" (Pimp) is catchy and funky, but in the lyrics, singer Judith Holofernes complains about record companies selling her songs and asking her not to experiment -- which is thoroughly unconvincing coming from a band on a major label (if you don't want them to sell your songs, build up your own little indie label) that never had an experimental bone in its body to begin with. There are only a few more good songs on the record: the first single's funky swing is infectious ("Gekommen um zu bleiben" -- "Come to Stay"), as is the Nena-ish rock song "Nur ein Wort" ("Only one Word"). The subdued groove of "Wütend genug" ("Angry Enough") is a hidden gem; unfortunately, the song's chorus is much less captivating than its verses. Many of the songs seem banal, however: in its focus on introspective numbers, many of the tracks blend into each other and only register after several listens -- even though their melodies and lyrics barely justify repeated spins. "Zieh dir was an" ("Put Some Clothes On") is about as irritating as "Zuhälter" -- a song about half-naked girls in music videos, largely (but not explicitly) aimed at Beyoncé and her ilk. Now, scantily clad women in the music business have indeed become a tiresome cliché -- but the band's observations about this development offer no insight whatsoever and sound more like the complaint of a conservative organization. Generally, little of VON HIER AN BLIND sounds as compelling and urgent as its predecessor, and the band largely seems to take a step back into a territory where they won't have to compete: in other words, they are playing safe, which makes for a mostly pleasant, but not overwhelmingly exciting record. This review was written for the All-Music Guide on October 3, 2007.